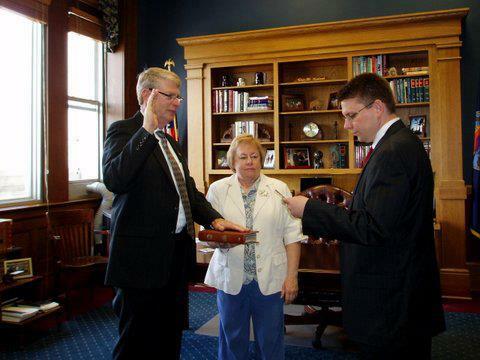 That's Dennis Kriegshauser, left, being sworn in to replace former Sen. Tim Owens in the Kansas Senate. His son, deputy secretary of state Ryan Kriegshauser, right, does the honors. Owens lost a primary to Jim Denning in August and stepped down from his role in office. This is a little late, but there have been other more important things going on. Anyway, in a largely ceremonial move, Dennis was selected for office last week. He'll serve for a few short months. As is maybe obvious by the photo, Dennis is well connected. His son is the second-in-command in Secretary of State Kris Kobach's office. His daughter-in-law, Christie Kriegshauser, works as a legislative director in the Kansas Legislature. GOP precinct people unanimously elected Dennis into Owens' seat. Dennis will be replaced when new Senators are elected and sworn in. In the race for Kreigshauser's seat are Republican Jim Denning and Democrat Lisa Johnston.